Everyone hopes to go sightseeing under the fine weather. However, my last guide of last year was in the rain. Things have both good aspects and bad aspects. Right. The sightseeing under the bad weather was, of course, not comfortable, but wherever we went, there were not so many people as usual. 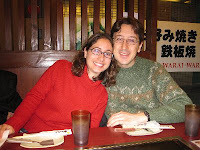 I showed a couple from Spain around in Kyoto on Dec. 13th. And it was raining. This was their first visit to Kyoto. So, we chose the typical course. The first leg was Kiyiomizu temple. 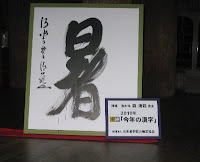 In Kiyomizu temple, in December, one kanji letter expressing that year was shown. The letter of 2010 was "暑" , which means "hot". As we spent the days in the cold climate in December, I almost forgot it was extremely hot last summer. The letter "hot" at the TV news reminded me of the harsh weather when I was doing the guide during the summer time. 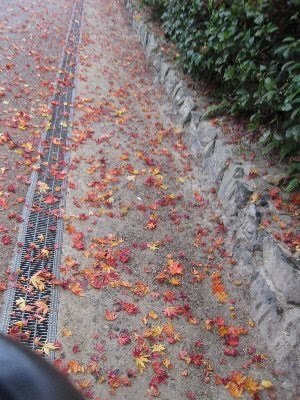 Luckily, we enjoyed some of the red-colored leaves in the tree and on the ground there. The long path from Kiyomizu temple to Yasaka shrine was good for finding souvenirs. They got interested in wind bells. The people a long time ago living without airconditioning tried to feel cool with various devices, like wind bells. Cool sounds from the bells will refresh us in summer time, not... in winter. But actually they gave us clear sounds. 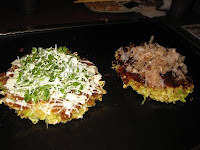 We had Okonomiyaki lunch. As they live in China, we talked about the life in China and I got to know the internet environment in China. We visited Nijo caslte, Golden pavillion and Ryoanji rock garden. These places are usually crowded with a lot of tourists. However, to my surprise, there are few people in each place. Though tourists usually have to wait for a while to have the pictures of them taken with the Pavillion as their backdrop, this time we were able to take photos as we liked. Sometimes I feel too many people viewing the rock garden spoils its beauty. This time, after I explained Zen spirit and what this garden showed, I thought they felt something zen.